Macaroons, Madeleines and Marie Antoinettes. Beautifully made in beautiful colours, and sold in beautiful packages. It was a wet, dirty February day in Toronto. One of those days when the city looks its worst. Dirty, grungy snow thawing to reveal lost water soaked mittens or tuques, broken bags of dog crap and the general refuse of the street that had been trapped under layers of ice. Whenever there's a thaw, it's always like that. One wonders how crappy the Earth looked after the Ice Age had thawed. It's surprising you don't see the remains of wooly mammoths when the winter snow recedes. It's on a day like that when a city like this needs a place as bright, airy and spring-like as Nadège. 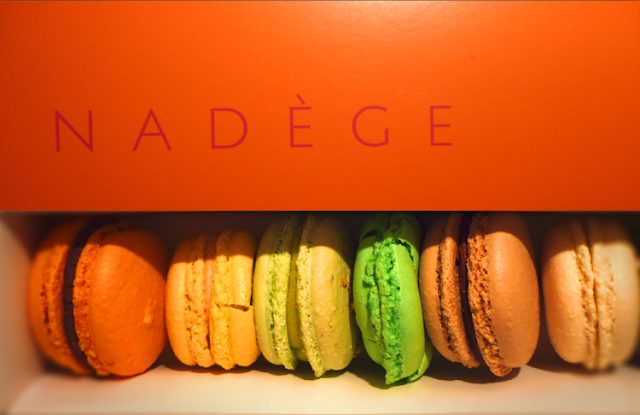 I've said before that Toronto doesn't deserve a patisserie like Nadège, but it definitely needs it.